Client Requirements: More space, more light, contemporary but traditional features. This client wanted to extend the small kitchen that was originally a pantry of their large victorian semi in Derbyshire. They wanted to create a space that was functional yet stylish, and a space that made better use of the natural light that had previously been restricted in this area of the property. They started the process by completing the short Your Build Plans Project Enquiry questionnaire: this provided us with an overview of their requirements and enabled us to provide an outline of what the project would require from a design and planning perspective, along with a cost outline and timescale. A Your Build Plans surveyor met with the home owners to discuss the project and survey the existing building. This full site survey and photographs enabled us to create a full production of as built drawings. The Your Build Plans design team then worked through some concept ideas with the client, being careful to not lose sight of the customers core requirements of the project and how they lived in the property. It was decided a lantern roof system with french doors would create the most utilisable space. The physical building extension was only a few feet but was structured in such a way as to maximise the available space and light. Once the delighted client gave us the go ahead from the concept drawings we worked full steam ahead on the production of a full planning pack and floor plans, elevations, and site documentation. The final details were produced and submitted to planning. As a registered planning agent Your Build Plans are able to manage and guide through the full planning process. The project was granted planning and Your Build Plans was able to provide details of certified Your Build Plans builders in their area who they could contact for construction quotes alongside any builders they found from elsewhere recommendation.
" ... We can't recommend Your Build Plans highly enough. 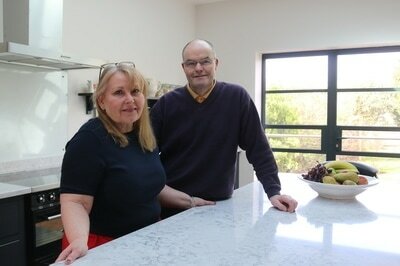 They were fantastic from the very first concept plan ideas right the way through planning and the successful competition of the build ... "
Do you have a similar home extension project? Start by submitting your design brief online here to get a quotation for the building plans that you will require for your project, and make sure you visit the Your Build Plans Ideas and Inspiration portal. Our essential guide to help you reduce the cost of your home extension and avoid costly mistakes. ​So exactly how much will an extension to your home cost you in 2017. Here is our guide to help you budget. Complete a Project Application to get a quotation for the creation of building plans for your project.